USA customers please note: due paid European import duties, sales tax and air-freight, prices are quite higher than "normal". Bon Cajun C accordion - a Special Gem with a great sound. this Original Louisiana handmade is in an as new condition, built in the heart of Cajun country Louisiana by the best accordion building cratftsman ever, Larry Miller. Woods: Curly Maple Bon, and this Specail One is a one of a kind special isue with decorated Black over White bellows, Cajun dry tuned, Binci #1 a Mano reeds. This is the real thing, don't miss out on this chance !! Bon Cajun C Akkordeon - ein besonderes Juwel mit einer großartigen Sound. Dieses handgefertigten Original Louisiana ist in einem neuwertig Zustand, kommt aus das Herz von Cajun Land Louisiana, und ist gebaut durch den besten Akkordeon Cratftsman Larry Miller. Holtz: Geflammtes Ahorn, und dieser Special ist ein eine besonder farbige Ausgabe mit schwarz über weiße bälgen, Cajun-dry gestimmt, Binci #1 a Mano Zunge. Dies ist das richtige Original; verpassen Sie nicht diese Chance ! Preis ist INCLUSIVE versicherte versand kosten innerhalb Europa. Das Instrument ist LEGAL importiert worden in Europa und kommt mit ein mehrwerts steuer INCLUSIVE rechtung. Gevlamd Ahorn Bon Cajun C melodeon, cajun gestemd, uitgerust met Binci a Mano of #1 handgemaakte tongen. Fantastische luide en volle klank. Uit Louisiana, Balg gedecoreerd, Zwart over Wit, Prijs is incl BTW op bon. Nieuwe koffer mogelijk. Curly Maple Bon Cajun in C, very mint condition. - Handmade by top notch builder Larry Miller and probably in his very best period of Cajun accordion making, around 2007. Cajun dry-tuned with Binci #1 reeds, and has Red over Red bellows, terrific overtone rich sound, plays well and fast. Gigbag included. Gevlamd Ahorn Bon Cajun C melodeon, cajun gestemd, uitgerust met Binci a Mano of #1 handgemaakte tongen. Fantastische luide en volle klank. Uit Louisiana, Balg rood over rood, Prijs is incl BTW op bon. Incl gigbag. A true collectors item; this sunburst flamed maple accordion built by Marc Savoy in the 80-ies is in a very mint condition with a great sound. Binci reeds, Cajun dry-tuned, flowered black over red bellows as commonly seen in the 80-ies, and not even a scratch on the corner pieces. Reed valves and waxing all checked, reeds tuned. No case. Tim Reed D accordion TERRIFFIC SOUND !! Tim Reed Black D, as NEW, terriffic sound and high quality workmanship. Colored BLACK, Cajun dry-tuned and has maple reedblocks, Binci #1 a Mano reeds. Metal buttons, and the instrument came from a non smoking home user, no case. Als nieuwe professionele diatonische Cajun accordion, in eind 2012 handgebouwd door Tim Reed met top kwaliteit materialen en het beste hout: Zwarte effen kleur, metalen toestsen, ahorrn tongen blokken. Toonsoort D, cajun gestemd, uitgerust met Binci a Mano of #1 handgemaakte tongen. Fantastische luide en volle klank. Uit Louisiana, met factuur als bewijs van legale invoer. good one from LA and affordable ! A quite early Randy Falcon accordion - This is a quite used one, proving it's a good instrument ... and with the famous Hohner T reeds, its age is unknown, and it has a probably new Black over Red bellows fitted a while ago by a known LA builder and repairman. It definitely plays and sounds quite better than any new Weltmeister or Japanese Hohner. It has an old case included. Valves, waxing and tuning have been checked, and it comes as it is at a fair price and might as such be a good choice for a beginner .... it comes as it is with no warranties, only refunds minus shipping paid if sent back immediately after returned receival and inspection on the instrument's condition after return. All reeds are working and tuning checked. - Note: one stop looks a little mis-aligned optically; it was built that way, and all stops work perfectly. great sound, mint condition !! This one is as it came from the factory, practically not used with still stiff bellows. Cajun and slightly wet tuned, no scratches or other damages. Great old fashioned sound, and ideal for a starting player with a smaller budget. No case. GREAT SOUND ! Occasion Jr. Martin Bb, Blue Maple, Maple reedblocks. Completely restorated accordion with NEW black over red bellows and quite a few other new parts. Keyboard overhauled and also restorated. No crawfish on the bellows! Antonelli reeds ! Price e-mail us: bayoubonton. No case. Tim Reed Black Walnut in C, NEW, with a terriffic sound and made with professional workmanship. Curly Walnut and with flamed mable reedblocks, Binci #1 a Mano reeds. Nieuwe professionele diatonische Cajun accordion, handgebouwd door Tim Reed van top kwaliteit materialen en het beste hout: Curly Walnut en flamed Maple reed blocks. Toonsoort C, cajun gestemd, uitgerust met Binci a Mano of #1 handgemaakte tongen. Fantastische luide en volle klank. Uit Louisiana, inclusief bouwers-garantie, behalve op de tongen. De prijs is incl BTW op bon. - NB Geen koffer bij geleverd, kan wel besteld worden, maar het instrument past in veel LP flightcases die lokaal veel goedkoper en goed verkrijgbaar zijn. Martin Bb Accordion, a very special one ! 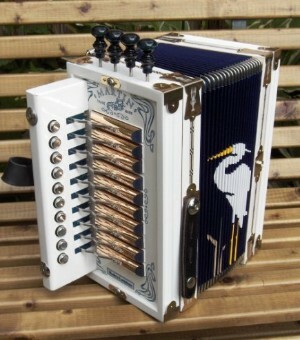 Martin Bb Accordion, in as new and mint condition with handpainted artist signed Egret on the bellows. A unique instrument and one of a kind. A very lightly built and fast player with a loud sound. Case included. Jr Martin in Bb, een unieke ! Door kunstenaar gesigneerde balg decoratie van een witte reiger uit Louisiana. Verkeert in nieuwstaar, inclusief originele koffer. as loud as they can get !! very mint accordion, cocobolo wood, with ivoroid buttons, gold plated hardware, built in microphone, Binci a Mano or #1 reeds tuned medium wet, with a great and loud Zydeco sound, bellows decoration to boot ..... no case. New warrantied accordion, profesionally made by Tim Reed, black finish, plastic buttons, siver colored hardware, Binci a Mano or #1 reeds.